Hope you’ll had a wonderful Labor Day weekend. You can file this one before He’ s The DJ, I’m The Rapper. As I mentioned a few post ago, the 4th piece to my Biz Markie collection was due to arrive by the end of last week, and it did, in the form of Goin’ Off . Goin’ Off is the debut album from Biz Markie, the O.G. of humorous hip-hop. As the regular readers know, I’ve written posts on The Biz Never Sleeps and I Need A Haircut, and other than a co-production credit going to his cousin/deejay Cool V, Biz handled the production duties on both of those albums. So, I was a bit surprised to look in the liner notes of Goin’ Off and see that Marley Marl was credited for producing the album from beginning to end. 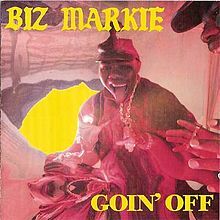 Goin’ Off didn’t move a ton of units but it did spawn a couple of mild hits, setting the stage for Biz’ sophomore effort The Biz Never Sleep, which would earn Biz a gold plaque as well as don one of the most commercially successful singles in hip-hop history. The Source also included Goin’ Off on their list of 100 greatest hip-hop albums of all time. This is my first time listening to Goin’ Off in its entirety. Being that it was released in ’88 and at that stage Marley Marl’s production was hit and miss on his other works of the same time period, I’m curious on how this will play out. Pickin’ Boogers – What better way to kick off the first song on his debut album then with a comical song like this. Over a simple Marley Marl drum beat Biz Markie recites Big Daddy Kane written rhymes about pickin’ boogers, and delivers them in a fashion only the Biz can. I mean, do you really think Kane would write rhymes for himself about such a juvenile subject? This was pretty entertaining. I’ll never look at spaghetti the same after listening to this. Albee Square Mall – Over a funky Marley instrumental Biz shows love for his favorite mall in the entire world and invites TJ Swan to butcher serenade the Albee Square Mall during the hook. I hope the Albee Square Mall compensated Biz for the advertising he gave them on this one. Biz Is Goin’ Off – Over a simple mid-tempo instrumental, the Biz makes a little music with his mouth (I love the high pitched squeally noise he makes at the beginning and end of the song) and mixes some comedy into his boastful rhymes for this title track. This was decent. Return Of The Biz Dance – One of my hip-hop record pet peeves: when the sequel of a song is sequenced on the album before the original. This is the remix to the original that we’ll get to in just a few tracks. Not a great song, but I’ve heard worse. Vapors – Marley samples James Brown’s “Papa Don’t Take No Mess” and hooks up a funky backdrop that Biz uses to dedicate a verse each to TJ Swan, Big Daddy Kane, himself, and Cool V as he repaints how people use to dis each of them but caught the vapors once they got one. Classic. Make The Music With Your Mouth Biz – This was the second single released from Goin’ Off . Over a decent instrumental (that samples Isaac Hayes’ “Ike’s Mood”, which Marley has sampled at least three times over the past 25 years) the Biz spits random rhymes and drops in an occasional beatbox. This is a remix, which is kind of annoying as it cuts out chunks of Biz’ rhymes. Biz Dance (Part One) – The sequel was definitely better than the original. Nobody Beats The Biz – I believe this was the second single released from Goin’ Off . Over a dope Marley instrumental the Biz spits arguably his best verses of the album while TJ Swan sings out of tune praises to Biz on the chorus. In Brian Coleman’s book Check The Technique the Biz says that he wrote this song (even though the liner notes credit Big Daddy Kane as the writer) after a group called Brothers released a record called “You Can’t Win” on B-Boy Records (the same independent label that BDP released their debut album Criminal Minded on) firing shots at the Biz. This may be the most vocally sampled song in the history of hip-hop. Seriously, there are no less than 100 vocal samples that have been taken from this song and use in other songs over the years. You don’t believe me? Listen and count them off. Cool V’s Tribute To Scratching – Biz rhymes praises to his deejay Cool V as he adds scratches in between Biz’ verses. In Brian Coleman’s Check The Technique, Biz says Cool V originally wanted to do a track using all Michael Jackson records but couldn’t get them cleared, so they went with this. Of the three Biz Markie albums that I’ve listened to and wrote about in the past few months, Goin’ Off is easily my least favorite. It’s not terrible, as it has a few undeniable classics, but the majority of the 10 tracks range from blah to hot garbage. This might come off as blasphemous to some but the biggest issue I have with Goin’ Off is Marley Marl’s lackluster production. I know Marley’s a highly revered hip-hop producer, rightfully so, but Biz is no slouch behind the boards either, as both The Biz Never Sleeps and I Need A Haircut are testaments to. Biz sounds more comfortable rhyming over his own beats, which may also have something to do the fact he was more involved with writing his own rhymes after Goin’ Off . Biz’ colorful personality does shine through at moments on Goin’ Off , but only enough to make the album an average listen. Biz released an e.p. first. That’s where you will find the original make the music with your mouth, and the biz dance. Than in ’87 he released nobody beats the biz single. About six months later he dropped the picking’ boogers single. Than he dropped the album. Like most albums from this era, the nconsumers only got three or four new songs.I really hate the remix of make the music with your mouth. If you can deedub, try to find ” the do- do” the b side of vapors. This should have been on the l.p.
your mouth. If you can deedub, try to find ” the do- do” the b side of vapors. This should have been on the l.p.